Historically, moles have been thought of as hideous growths that donned the faces of witches and other undesirable characters. Celebrities such as Cindy Crawford, Madonna, and Marilyn Monroe were each photographed with facial moles during their careers. Subsequently, moles became known as beauty marks. Scientifically, moles do indicate a lower incidence of age-related diseases. 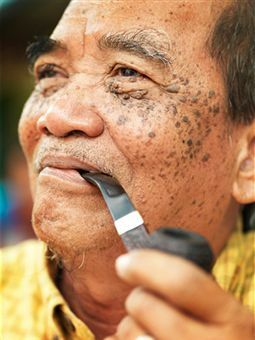 Experts speculate that the more moles a person possesses, the lower the risk for age-related diseases. Moles often appear as raised or flat round spots on the surface or the subdermal layer of the skin. Moles that form on a superficial layer of skin are comprised of melanocytes. Melanocytes are melanin producing cells that are located in the bottom layer of the skin’s epidermis. Melanin refers to the pigment that determines the color of the skin. Moles are present on any portion of the body. Moles may either be small or large. The range of mole colors varies. Moles present on the body may be black, brown, red, pink, or the natural color of the individual’s skin. Most moles however, are either black or brown. Moles may appear as a cluster or as one single unit. The average person may have 50 moles or more on the body. One in every 100 infants is born with a mole present somewhere on the body. The American Academy of Dermatology states that the majority of moles develop within the first 2 decades of a person’s life. Moles that are acquired may be a benign neoplasm. Congenital moles are considered to be a malformation or hematoma. These types of moles may develop into melanoma at a later stage. Moles do occur on the palms of the hand and the bottom of the foot. Moles located on the underside of the foot are more common in the Asian population. Some malignant melanomas are more likely to develop on the leg. As a general rule, if hair is growing from the mole, then it is not malignant. It is debated whether moles that are constantly aggravated will result in melanoma. Most experts respond, “No” to this belief. However, some suggest that a mole receiving irritation from an outside source may undergo malignant changes. Most individuals prefer to have moles removed for cosmetic reasons. This group is typically self-conscious about the moles and would feel more confident socially, if they were removed. Others worry that moles will develop into malignant cancer and remove the moles as a precautionary measure. Those people, whose moles are found malignant, must remove them before cancer spreads into the body. These lesions are typically flat and black or brown in color. The lesion is located between the epithelium and the dermis. Compound nevus describes beauty marks. Beauty marks are slightly raised and are brown or black in color. The lesion is a mixture of skin layers. Intradermal nevus cells may be primarily found in the dermis layer of the skin. Most are these cells are raised and flesh colored. Dysplastic nevi may be flat or raised. The nevi are characterized by irregular borders and coloration. Because of the irregularity, they often resemble melanoma. People with dysplastic nevi should consider being tested to determine if the lesion is cancerous. The National Cancer Institute states that dysplastic nevi are more likely to develop into a malignant growth. The melanocytes in this type of mole are blue in color. The cells often form a spindle shape in the deeper layer of the dermis, while the covering layer of skin remains normal. These types of nevi are typically present in the intradermal layer of a child’s skin. The lesions are raised and reddish in color. This type of lesion may also appear on the leg of a woman. This term refers to a a melanocytic nevus that is not present at birth. The lesion may consist of junctional, compound or intradermal nevus. This type of lesion is present at the time of birth. The lesions are typically small to large. The smaller lesions are less likely to form a malignant cancerous growth. As the lesion grows, there is more potential for the lesion to develop into a malignant cancer. These lesions are normally large and hairy. They are also black to brown. Ten to fifteen percent of these lesions will develop into malignant cancer. These lesions may actually be found in the mouth or around the genital areas. If the lesion is located in the mouth, it is typically found on the upper hard portion of the palate. These lesions are typically present from birth. The flat, brown lesions are often located on the face or shoulder of the person. Asian babies often have these large, blue colored lesions on their backs. Lesions may grow back after being removed surgically. The recurring growth is often caused by melanocytes that remain after the surgery. These scars are often indistinguishable from malignant cancer cells. Therefore, a problem may occur if they are not completely removed. The most common cause of a mole results from hyperpigmentation of the skin. Genes may also play a significant role in an individual’s development of moles, since most are present from birth. Dysplastic nevi and “atypical mole syndrome” may also be the cause of mole development. Both of these conditions are heredity. People afflicted with the condition may have 100 or more moles. Some of the moles associated with this condition may be large or atypical. Moles associated with dysplastic nevi are more likely to develop into a melanoma. People who have more than 50 normal moles are at a greater risk of developing a cancerous growth. A majority of cancerous growths do not form from pre-existing moles, but generally form a new mole on a superficial layer of skin. 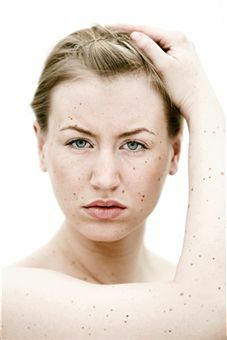 People who have freckles have noticed an increase in the number of freckles when exposed to sunlight. Darker skin people, who have more melanin to deflect UV light, possess fewer moles. People with dysplastic nevi have few moles on the buttocks. Experts suggest that moles are fewer in this area, because it is not exposed to sunlight often. Some experts suggest that moles are an indicator of a potassium deficiency. Experts recommend eating foods containing potassium or taking a potassium supplement. Bananas and apple cider vinegar are high in potassium. Potassium is beneficial for many reasons and can be taken as a supplement in tablet form. People who possess 50 moles or more possess a higher risk of developing a cancerous mole. The American Academy of Dermatology states that most moles are benign. However, in 2008, there were nearly 63,000 reported cases of melanoma, according to the National Cancer Institute. As a result of cancer, nearly 8,500 people died. Malignant moles that are not properly removed may affect other areas of the skin and the body. Therefore, it is imperative to address cancerous growths and moles, as soon as possible, to eliminate the disease. People with low potassium intake are at risk for developing a cancerous legion. Moles often develop as an indicator of potassium deficiency. People with fair skin are more likely to have moles. Therefore, they are also more likely to develop a cancerous mole growth on the body. Excessive exposure to Ultra-Violet (UV) rays or sunlight may cause moles to develop. The American Academy of Dermatology and National Cancer Institute recommends avoiding the sun during peak hours. These hours range from 10 AM to 3 PM standard time. Wear sunscreen, hats with wide brims, and sunglasses with UV deflecting lenses. Avoiding the sun will deter mole growth and possible cancerous mole development. Individuals with moles are also instructed to consume healthy amounts of potassium. Potassium may be found in apple cider vinegar, bananas, green leafy vegetables, or a potassium supplement. Dermatologists will often employ the ABCDE guideline in order to make a diagnosis with the physical, trained eye. Alternatively, a dermatoscopy may be used as well. A dermatoscopy is a magnifying tool used to examine the lesion for cancerous cells. D: Moles greater than 6 mm in diameter are more likely to be cancerous growths. However, this finding is inconclusive. Many moles are cancerous from their initial inception. E: The mole is enlarged or evolving. Seborrheic keratosis is often mistakenly diagnosed as a melanoma cancer. The benign growth originates in the keratinocytes. Select an experienced doctor who can distinguish between the two types during examination. Moles that have jagged edges, itch, bleed, develop inflammation or become larger than a pencil eraser should be examined by a physician immediately. If a physician suspects the lesion is cancerous, a biopsy must be performed prior to removal to determine the best method. Removal of cancerous moles may be removed by excisional biopsy, laser, electrocautery, surgery or shaving. The shaved site will leave a red mark that will return to the skin’s normal color in approximately 2 weeks. The process should leave little to no scarring. Most insurance companies do not cover the removal of benign moles. To remove a mole, soak gauze in a baking soda and castor paste. Place the gauze over the mole. Leave the gauze on overnight. Over time, the mole will reduce in size. Make a poultice of ground coriander and apply it to the mole. This will remove the mole in three days. Extract the juice from sour or highly acidic apples, such as “Granny Smith” apples. Apply the juice three times per day for three weeks. The mole will begin to thin and disappear over time. Apply the juice of an onion regularly. Make a poultice of ground cumin and apply to the mole for three weeks. The mole will begin to disappear. This is recommended for moles that are bleeding. Consume a healthy amount of potassium every day to remove warts and prevent their development or growth. Cut a single clove of garlic and cut the clove in half. Secure the garlic half onto the mole with tape and gauze. Leave the garlic for 24 hours or apply for 3 days. The sulfer present in garlic will cause the mole to disappear. Roast the peel of a pomegranate. Then, soak it in lime juice and make it into a paste. Apply the paste to eliminate acne, warts or moles. Slice a potato and place it on the mole several nights. The mole will disappear over time. A mole will disappear in 2 to 3 days after applying iodine to it overnight. Apply aloe vera to the mole for 2 to 3 weeks. The gauze must be changed frequently for the process to be effective. Applying Echinacea helps in the prevention of moles. Apply honey several times per day. In most instances, the mole will disappear completely. Tea tree oil is common for wart and mole removal. Apply several times per day for the best results. Duct tape on warts and moles has also been cited as a popular remedy. Dandelion root applied three times per day will also remove moles and warts. Daily use of Vaseline Intensive Care will reduce the appearance of moles. Dissolve an aspirin with a drop of water. Apply the paste to the mole. Cover with a band aid. Repeat the process twice per day. Many mole removal products are available online or over-the-counter. Most possess pharmaceutical strength, but they are 100 percent natural remedies. Some of these products originate in other countries, such as Madagascar. The moles are eliminated in days with some of these products. Some are made of essential oils and have anti-melanoma properties. When the products are applied, they absorb into the skin and penetrate the cell membrane to eliminate the mole completely. Many can be found online for reasonable prices. Consult a plastic surgeon or a skilled physician to use medical lasers to remove flat moles from the skin. This process may also work on some raised moles as well. Laser treatments only cauterize the surface layers of skin. Most moles penetrate beneath the surface layer. Therefore, the laser may not remove all of the melanocyte cells associated with the lesions. This becomes a problem if the mole is malignant. If the mole’s cells are cancerous, it is imperative to remove each of the cells. Otherwise, recurring nevus may occur. Surgeries are recommended in these instances. Mole surgery actually penetrates deep into the skin via an incision. Sutures are necessary after surgeries. In contrast, laser mole removal only forms a scab briefly and heals within 7 days. As mentioned previously, mole surgery is the only way to ensure that all cancer cells are removed from the area. To prepare for mole surgery, liquid nitrogen is typically applied to the raised mole. The physician will shave the mole from the body with a scalpel. The physician may also cauterize the area to avoid excessive bleeding. Cauterization is performed in instances where the incision is difficult to close with stitches. Liquid nitrogen is not recommended for melanoma or cancerous moles. After surgery, the area will take some time to heal. In most cases, the healing process takes two weeks. While the area is healing, change the bandages often. Avoid exposure to water for the two weeks. Also, avoid exposure to sunlight. Electrocautery actually burns the mole from the skin. A mild anesthetic is applied locally before the procedure. In most cases, patients must undergo 1 to 3 treatments to completely remove the mole. Since the electrical currents only reach the superficial layers of skin, scarring is less likely to occur. The risks of mole removal vary depending upon whether the mole is malignant or benign, large or small, flat or raised, or a host of other characteristics. The risks also vary depending upon the method of removal. If the mole is malignant, the patient will most likely undergo a surgery. Surgeries consist of freezing, incision, and sutures. The risks may include scarring and recurrent growth. Recurrent growth may occur if all of the cancerous cells are not removed properly. Redness and inflammation in the area may also occur. As with any surgery, there is a risk of infection in the open wound. Some individuals may even experience allergic reactions to the anesthetic or nerve damage. Laser removal risks may include a scab, possible scarring, infection, and recurrent growth. Home remedy risks are few. Some individuals may experience an allergic reaction to one of the natural agents. Patients should be aware of any food allergies before trying a home remedy. Is there any solution or home remedy to vanish a dark black subdermal mole (naevus) on face which is totally flat and deep inside the skin. I have dark blue or black mole right on the centre of my nose. Described as junctional nevus in ur article. It looks quite visible n at times funny due to its size n darkness. As i am very fair with no other spots on face, it becomes more prominent. I try to hide it with foundations n concealers, but once the makeup is gone it again appears making me look funny. Surgery can benefit me but the doctors says that it will leave a rather larger mark after the surgery. It is not like a bulge, nor is it raised. It is a flat spot, perhaps a birthmark. Please help me and give a solution to whiten or vanish it or hide it atleast for one whole day. Makeup doesn’t work. Thank u.
I was having a red acne 1 or 2 weeks back.I don’t know when I scratched it and it turned into a small black mole.plz give me a solution(home remedy)so that I can completely remove it or vanish it. I have a infernal mole in my back. Last year, my doctor said leave it. However, some days it changes in size. Should I get another opinion? If I try one home remedy and it doesn’t work is it safe to immediately try another one or should I wait any amount of time before going to the next one?